In America, there is a saying "Keeping up with the Jones" which basically means people are always trying to match their neighbors possessions. Portugal over the last 700 years had taken it to new levels. Each new Castle, Palace and Monastery we visit keeps giving us a "Wow" reaction. For purposes of safety from invading armies, the castles are usually at the top of the highest hill/mountain around. Many new technologies were developed for the purpose of lifting huge stones into place. When a new King/Ruler/Bishop came into power they wanted their own monument to their awesomeness and higher walls were built. We missed many castles and still felt like we were living in Playmobile toy land, or sets from the Game of Thrones. Traveling in April we were sometimes alone, and were transported to another century. Magical. Dom Nuno Alvares Pereira, Portuguese General, Monk, and Saint from the 14th century (and I'm not talking about the guy on the left)... well known for his role in leading Portugal to independence during the Battle of Aljubarrota in 1385. ...then the Romans (who left their mark everywhere), Visigoths, Moors (for 400 years), then taken from the Moors by the 1st King of Portugal Alfonso Henriques in 1148. Of course one always love to hear of the stories and legends that are part of the town. One is the legend of a small black wooden Madonna "Our Lady of the Nazareth" - supposedly carved by her husband Joseph the carpenter in Nazareth, and brought here from Galilee through Spain. 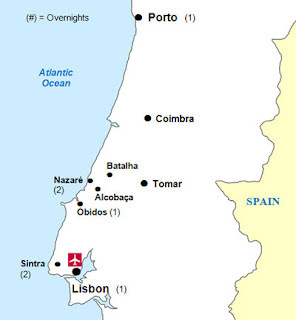 Hence the name of the town Nazare! There are about 500 black Madonnas in Europe and many are associated with miracles - as was this one! ....Alfonso spent time rebuilding the walls and fortifying the castle against enemy attacks and it was here that he planned his strategy to take back Santarem, Sintra, and Lisbon from the Moors in 1147. King Alfonso I was a busy man spending the majority of his life fighting the Moors. The first stone was laid in 1160 by Gualdim de Pais, (who fought alongside Alfonso Henriques against the Moors) the 4th Grand Master in Portugal of The Order of The Knights Templar. The Castle was the headquarters and stronghold of The Knights Templar for many years... Fast forward to France where King Phillip IV of France and Pope Clement V on Friday, October 13, 1307 falsely accused the Knights Templar of heresy and arrested the French leadership of the Templars and ordered all Templars arrested (many in France were burned at the stake) and that was the end of the Templars ......or was it?? Lot's more to this story you will have to Google. Portugal's King Dinis allowed the Templar members to regroup under the new name of "Order of Christ" in 1319 with their headquarters moving to Tomar in 1357.
was built in commemoration of the 1385 Battle of Aljubarrota - A major Portuguese victory and independence from the Crown of Castile. Built in the 14th century, it holds the tombs of King Joao and Queen Filipa and their children including the famous Henry the Navigator. it was worked on for 200 years and still there is an unfinished chapel. The Monastery of Batalha is a UNESCO World Heritage Site - stunning! Spring Break in Lisbon and the daughter is here on a break from her Stockholm studies. The Palace was built from the ruins of an 18th century monastery that was damaged by lighting and later destroyed by the Great Lisbon Earthquake of 1755. In 1838 King Ferdinand II built the palace as a summer residence. Rich walks the walls pretending to protect his people from invading forces ....what? The only invading forces I see are all the touristas! "Portal of the Guardians" ...has a hidden entrance way to the "Initiatic Well"
...Labyrinthine Grottoes connected by tunnels are found throughout this unique garden - it is easy to get lost here - quite incredible! View of the chapel from the top of the Palace... The crypt has a subterranean passage that links it with the main house. All in all, a tiring but fascinating day!!... Thank you Renata! I think it's time for dinner and a drink or two! Some things do not change, college kids still drink Mateus - probably because it was cheap then and it's still cheap!!!... love it! ...Dinner was a Portuguese Seafood Cataplana!! Hope you can visit someday!.... Saude!! We did miss a few sites such as the National Palace of Sintra that we will have to save for another day! Renata goes back to Stockholm, and we head to the north of Portugal!